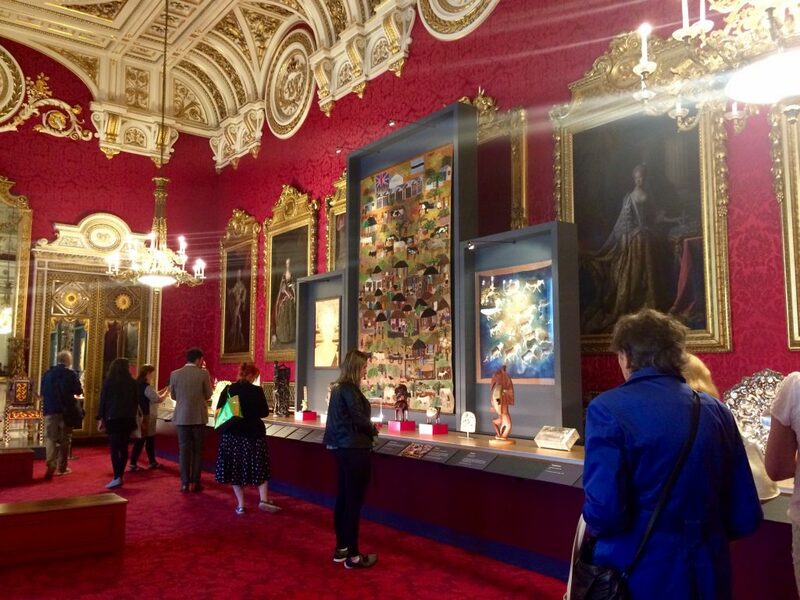 When the State Rooms at Buckingham Palace open each summer there is a ‘special exhibition’ included to give a reason for return visits. For summer 2017 it’s Royal Gifts that have been presented as part of the Queen’s duty. When Heads of State pay a visit to another country both leaders exchange gifts as part of formal events. Gifts are chosen to reflect local craftsmanship and gifts from the UK are often created by companies that hold a royal warrant. 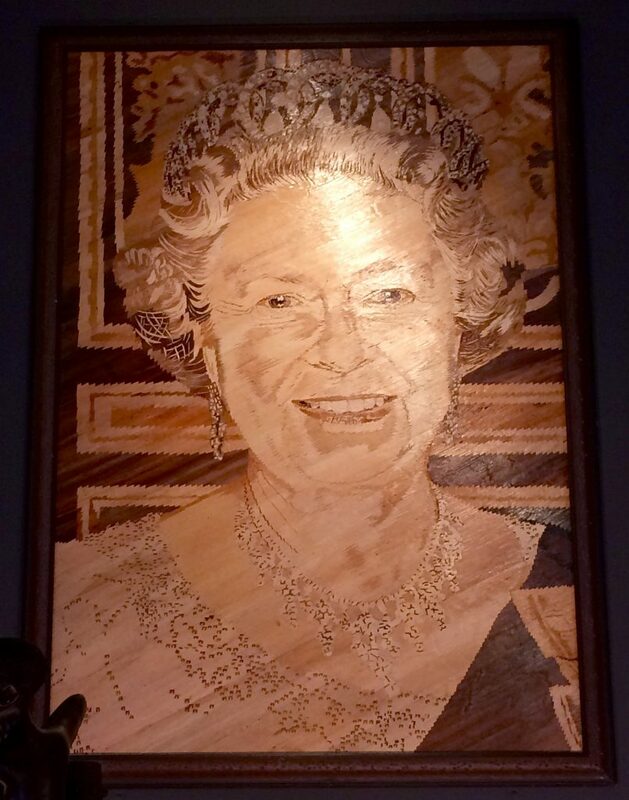 The longest-reigning British monarch, Her Majesty The Queen is also the most travelled sovereign in British history, undertaking more than 250 overseas visits in her 65-year reign. During 2016 alone, The Queen carried out over 300 official engagements the length and breadth of the UK. 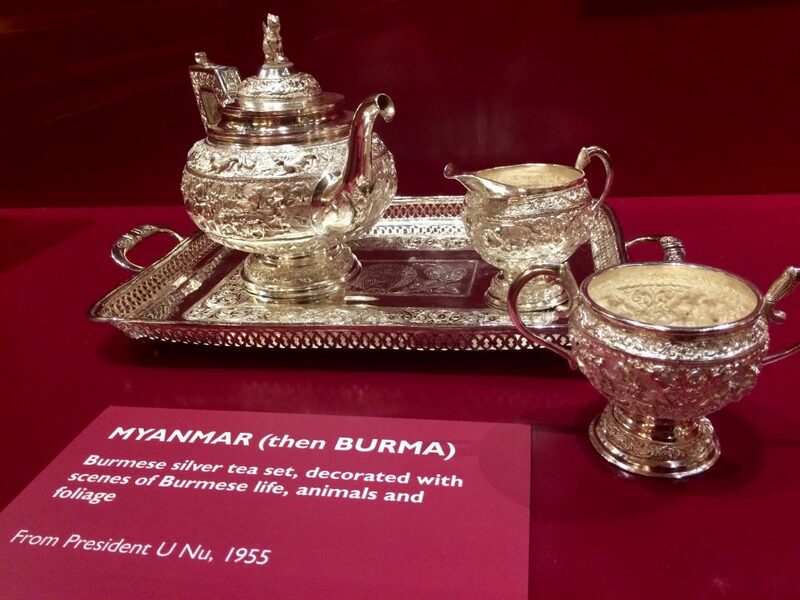 Royal Gifts explores Her Majesty’s role as Head of State, Head of the Commonwealth and Head of Nation through gifts presented by people from all walks of life and from over 100 countries and territories during State Visits, overseas tours and official engagements both at home and abroad. 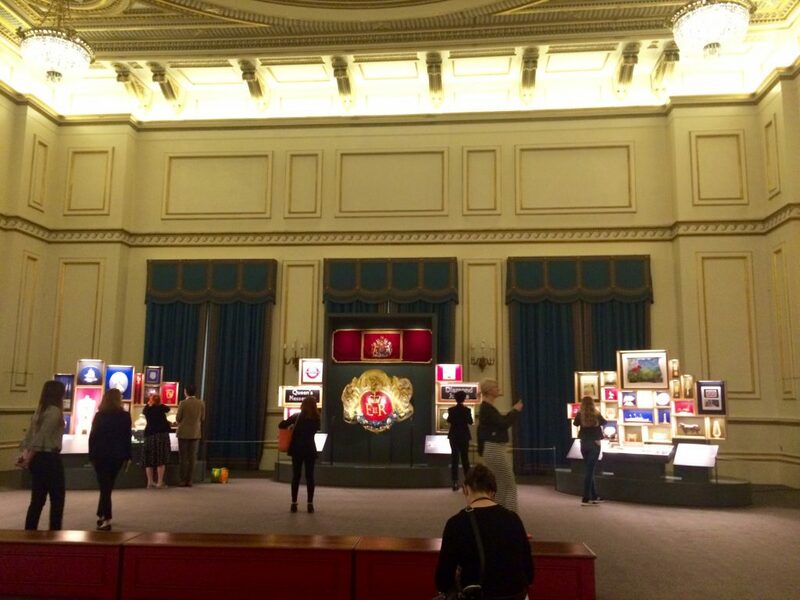 Usually the ‘special exhibition’ is in the Ball Supper Room – a large room next to the Ballroom – and the Ballroom. 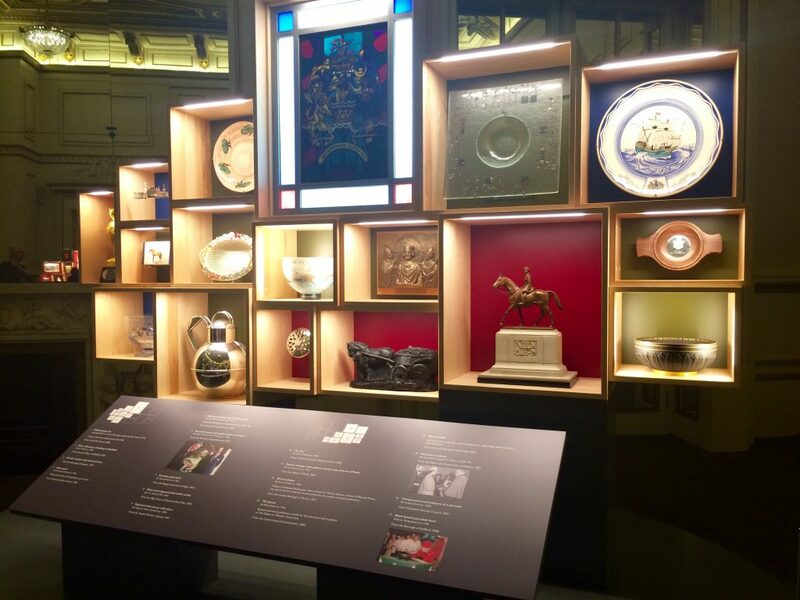 But things have changed this year as Royal Gifts is displayed throughout the State Rooms so you have more to see in each room (admire the room AND the extra exhibits). 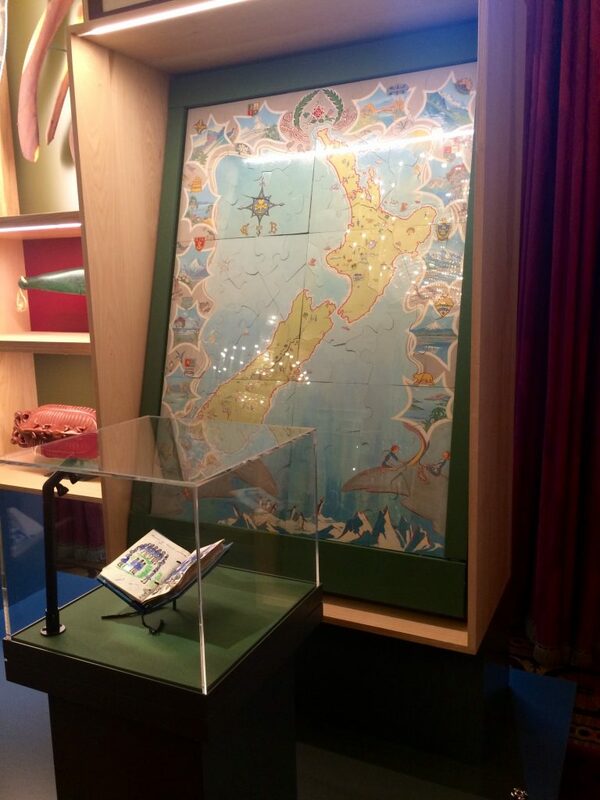 The exhibits have been displayed grouped in regions so the first room has Europe, then Oceania, etc. 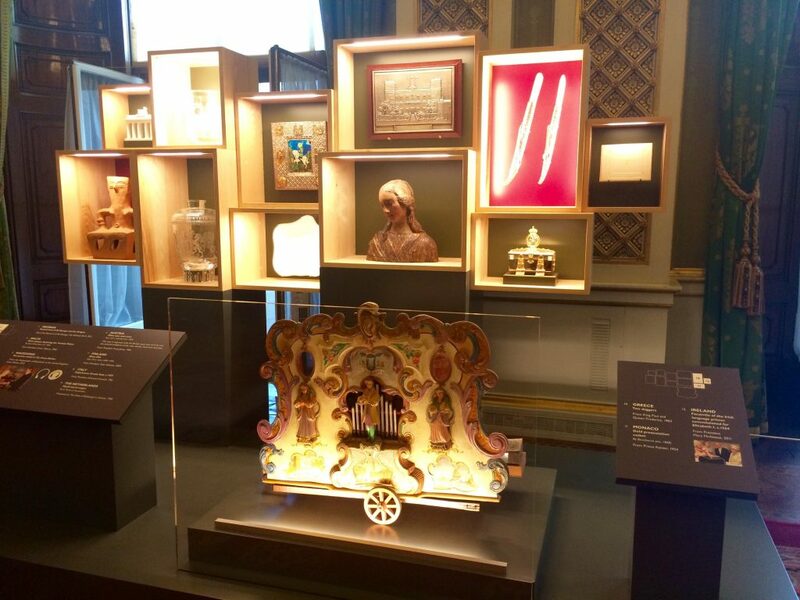 It’s all very up-to-date as alongside the curated gifts from Europe is a special cabinet displaying the gifts from the recent Spanish State Visit in July 2017. 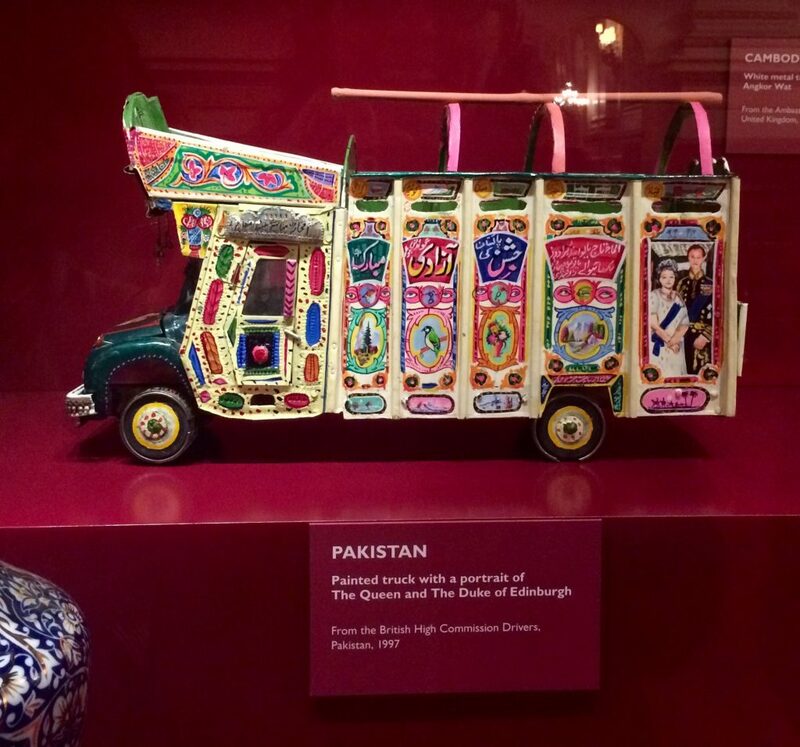 The Ballroom has gifts from Asia and the Middle East, and the State Dining Room has gifts from Africa. As well as spreading out the exhibits this year, the curatorial team have also ensured the captions are not all in one place. 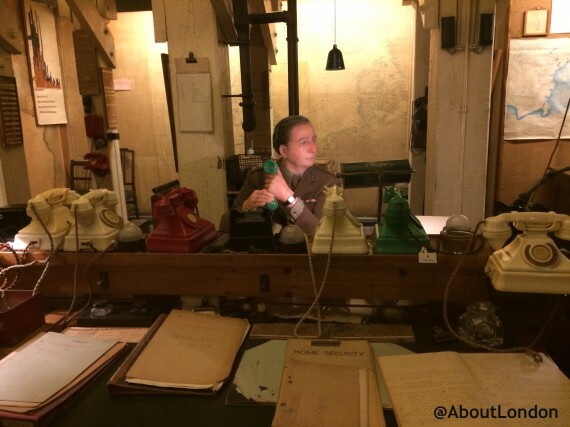 It can be really frustrating to see something interesting and then move over to read the caption information along with every other visitor as the captions are all in one place. 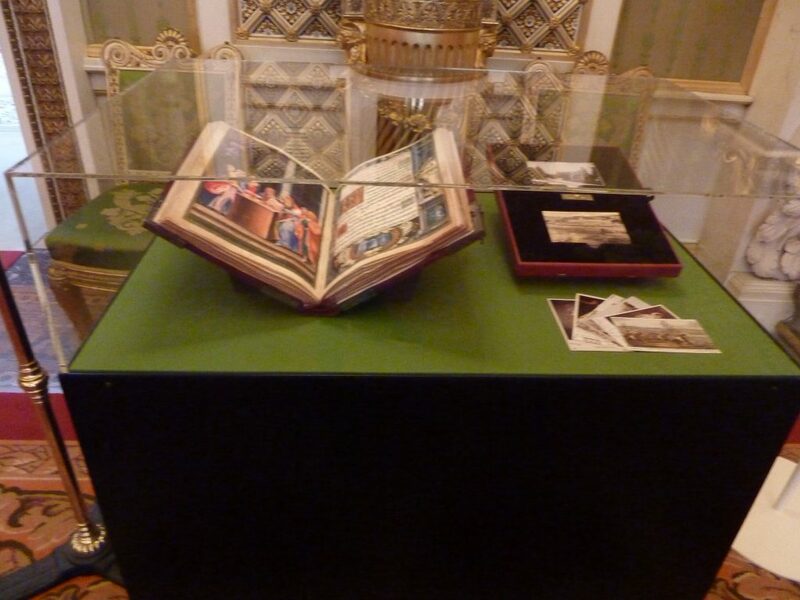 I really liked the Girl Guide jigsaw and book of signatures from Australia in the Throne Room. The curators have been in contact with some of the girls who signed the book and they are coming to visit the exhibition. 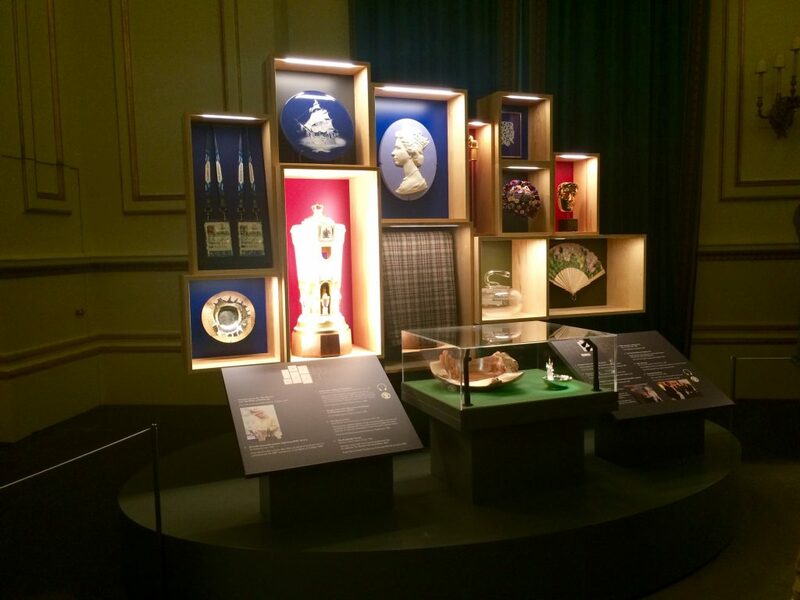 This year, the Ball Supper Room has a display of gifts from across the UK. 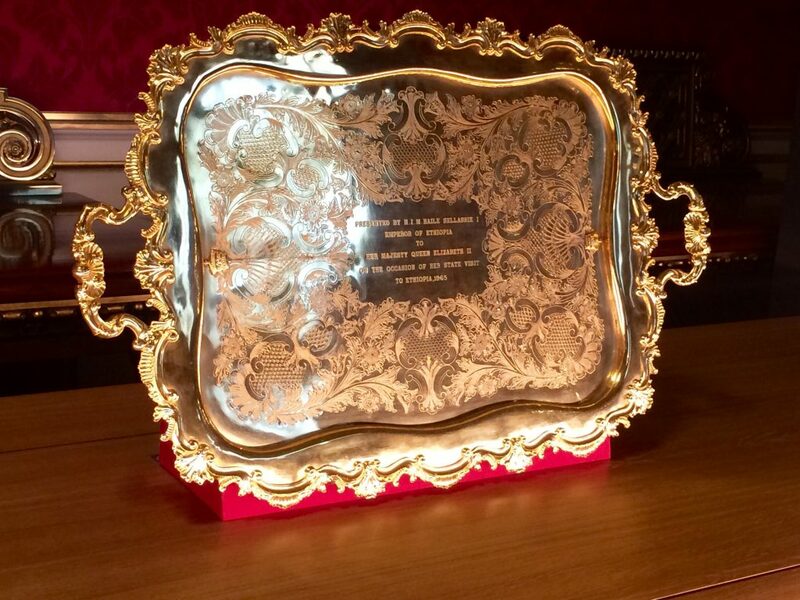 The centrepiece is a gilded and painted fibreglass prow from the boat used at the Thames Diamond Jubilee Pageant in 2012. 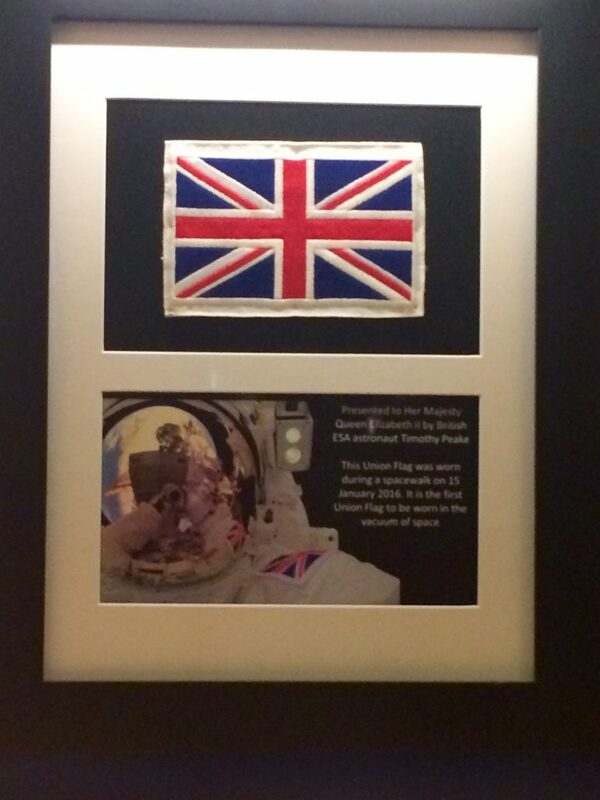 Do look for the Union flag badge worn in space by Major Tim Peake CMG, which was presented to The Queen at Windsor Castle in April 2017. 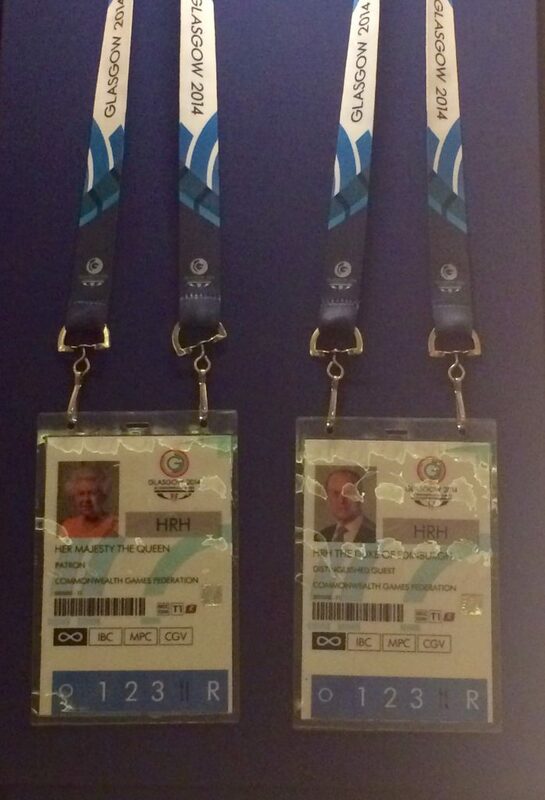 And I also liked the Commonwealth games security passes for The Queen and Duke of Edinburgh. The Blue Drawing Room has the Americas (South, Central, North and Caribbean). 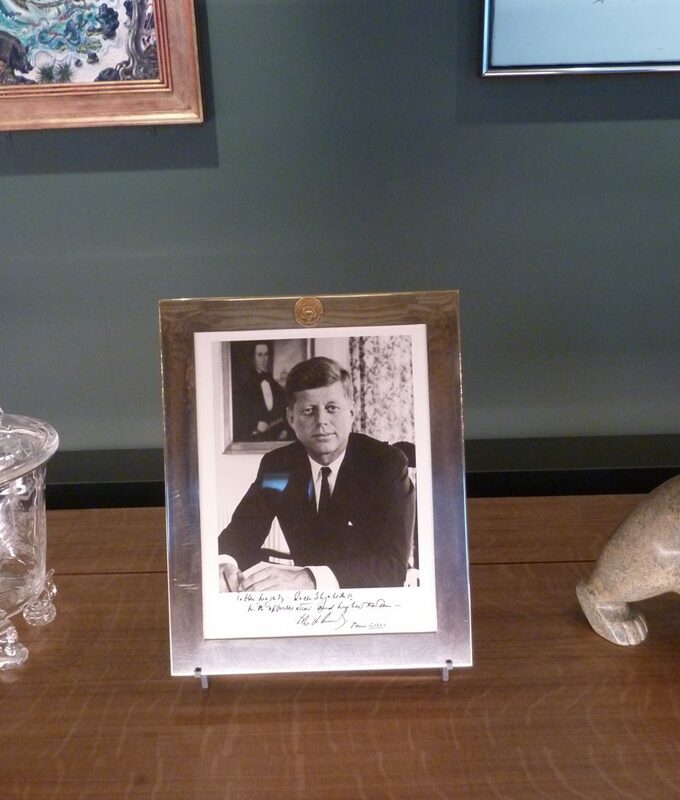 This includes one gift that wasn’t from a State Visit: a signed photograph from President Kennedy. 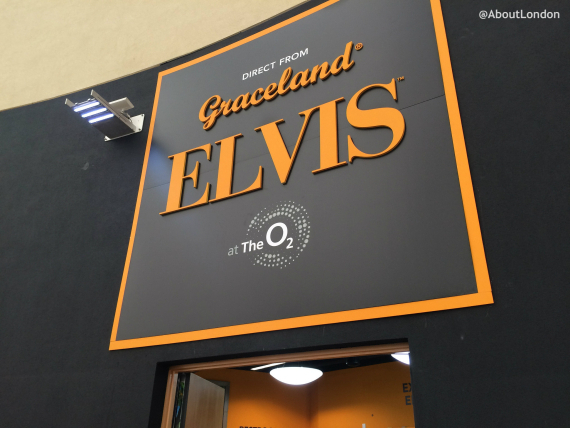 He was visiting London for a family event so it wasn’t an official audience with The Queen. An official State Visit was planned but, sadly, it never got to happen as he died too soon. This summer marks the 20th anniversary of the death of Diana Princess of Wales on 31 August 1997. From the outset of her marriage, The Princess undertook many official duties in support of The Queen, both at home and abroad. 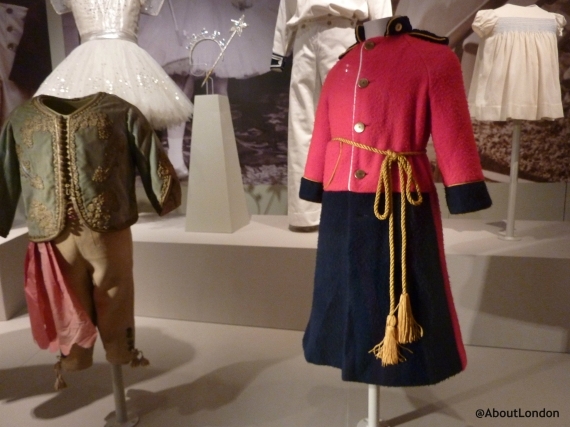 As a tribute to The Princess, this work is remembered through a special display in the Music Room. 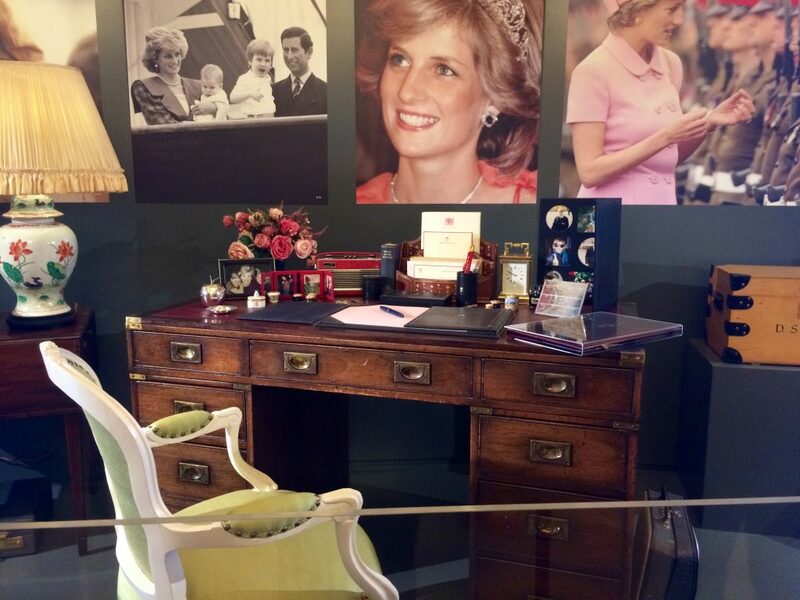 The display has her desk from her sitting room in Kensington Palace with all the nick-nacks a home office often includes. 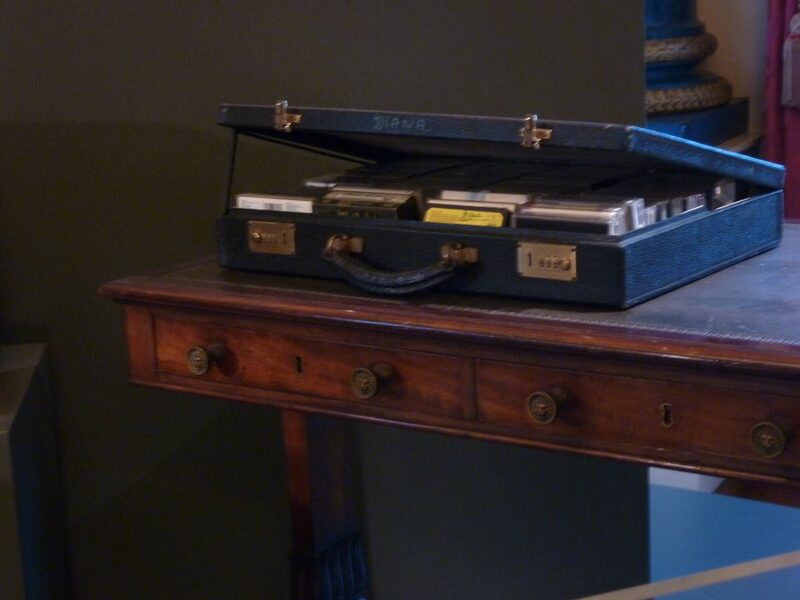 I particularly liked her case of cassettes which includes albums by Diana Ross, Elton John and George Michael. 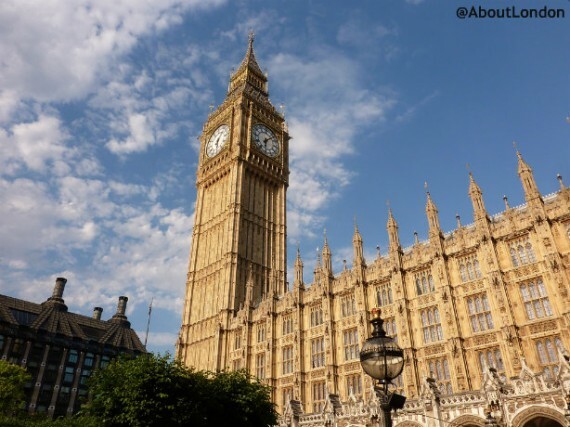 Your ticket includes a free multimedia tour so you can find out more about each of the State Rooms. I recommend spending time in the Picture Gallery as it’s full of masterpieces. And the ticket is actually really good value as, if you purchase your ticket directly from Royal Collection Trust, you can convert it to a 1-year pass for free. That means you can return as many times as you like – including during next year’s summer opening. 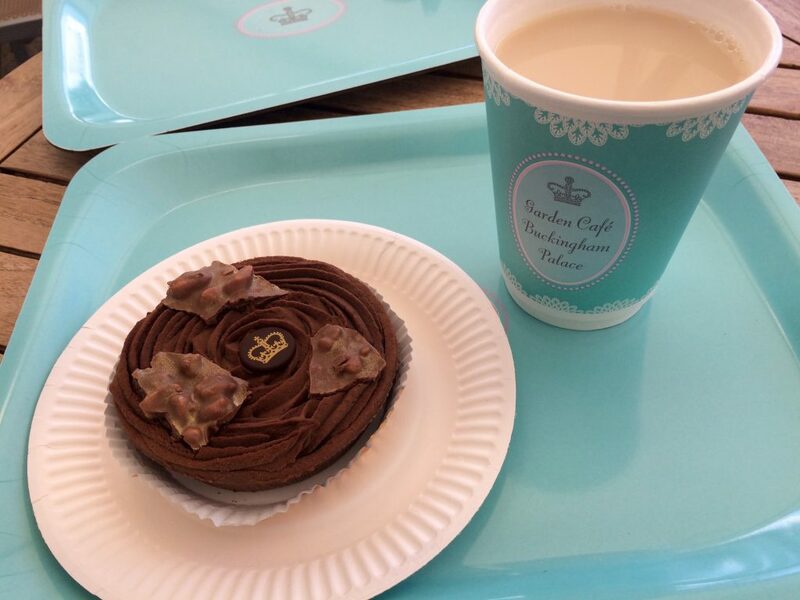 There’s a lovely cafe on the Terrace overlooking the palace gardens. And If you bring children, the Family Pavilion opposite is superb. It has games, dressing up and photo opportunities, craft activities and a chance for families to relax together. Disclaimer: As is common in the travel industry, the writer was provided with complimentary services for review purposes. While it has not influenced this review, I believe in full disclosure of all potential conflicts of interest. Do note, while I was allowed to take photos during my visit photography is not allowed during general admission times.